The Mass Rapid Transit Authority of Thailand (MRTA), an agency responsible for the operations of rapid transit systems in Bangkok and other provinces, will take legal action by asking the court to order the Bangkok Mass Transit Authority (BMTA), the city bus agency, to move 84 NGV buses out of its land. 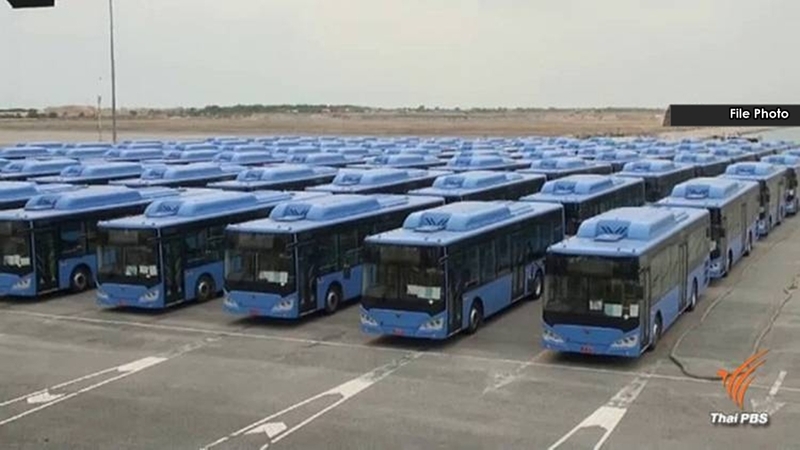 Rithika Suparat, acting governor of the MRTA, said he last week sent a letter to ask the Office of the Attorney General (OAG) to file a lawsuit for the court to order the BMTA to move 84 NGV buses out of its land on Rama IX Road in Huay Khwang district. The land is intended for the construction of a maintenance and repair centre of the electric trains for the Orange Line (Thailand Cultural Centre – Suwinthawong). Mr Rithika said if the 84 NGV buses are not moved out, the contractor for the construction of the centre may sue and demand compensation from the MRTA as it would not be able to carry out its work. The BTMA had earlier received permission from the MRTA to use the land to keep the 84 NGV buses. However, the BMTA is having a legal dispute with Bestrin Group over the 84 NGV buses. Since the legal dispute between BMTA and Bestrin Group has not been settled, the MRTA is afraid this may affect its plan to build the electric train maintenance and repair centre there, Mr Rithika said.